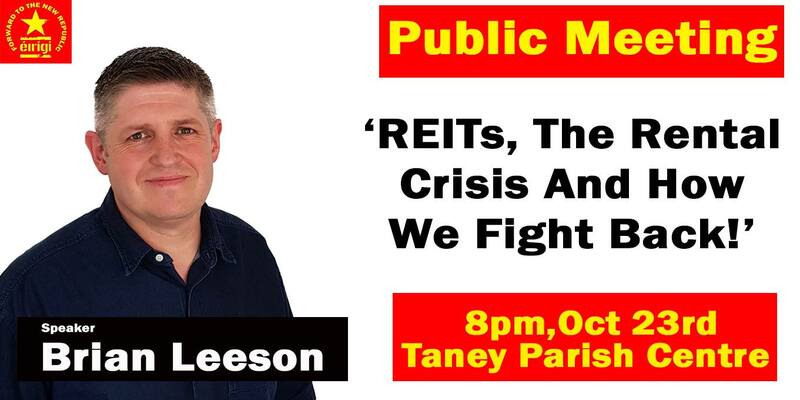 Éirígí Dublin South have a really important public meeting coming up next week. It will shine a bright light on the role that Real Estate Investment Trusts and other institutional landlords are playing in the Rathdown constituency, where half a dozen companies have amassed a portfolio of over 2,000 homes in just five years. The following was issued by Éirígí on October 4. You can check out the party website by going to the links section on this site. 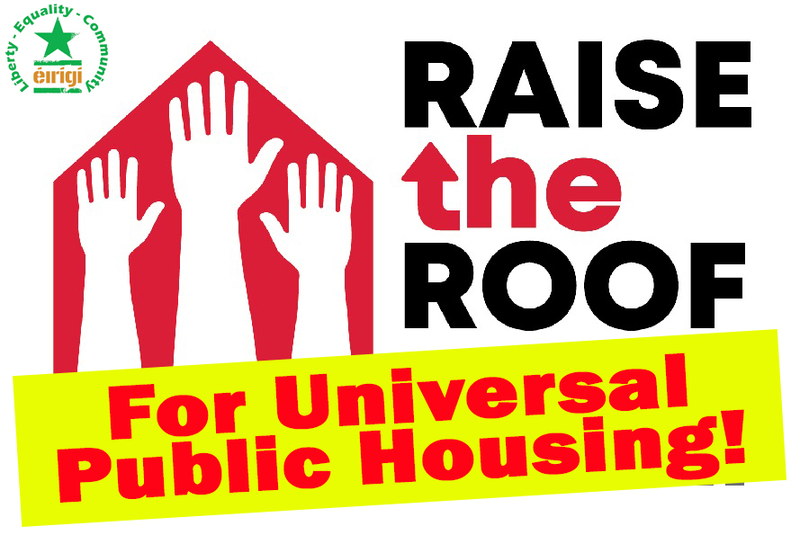 Yesterday (Oct 3) saw thousands of people mobilise in response to a call from housing groups, trade unions and political parties to ‘Raise The Roof’ in response to the housing scandal in the Twenty-Six Counties. The rally was organised by the Irish Congress of Trade Unions and supported by the National Women’s Council, the Union of Students in Ireland and others. These organisations represent hundreds of thousands of Irish workers, women and students that are being adversely affected by the chaos of privatised housing. The fact that such a breadth of ‘civic society’ is now coming together with housing and homelessness organisations to demand housing justice is a very welcome development. Housing has been Éirígí’s key campaigning issue for close to three years. During that time our activists have consistently worked to build a mass campaign for housing justice. To this end we have distributed tens of thousands of pieces of literature; organised countless public meetings; participated in direct actions; helped form housing action groups and homeless outreach groups; networked with other like-minded individuals and organisations to build alliances in support of our key housing demands. The Six Counties, like the rest of Ireland, is in the midst of a severe public housing shortage with supply far outstripping demand. The issue of public housing played a key role in the Civil Rights movement during the late 1960s/early 1970s. 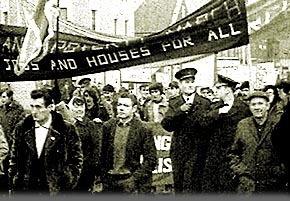 Prior to the creation of the Housing Executive in 1971, public housing had been allocated by local councils, and within unionist-controlled councils, discrimination in housing allocation was widely practiced against members of the minority Catholic community. Indeed, the right to, and fair allocation of, public housing were key demands of the Civil Rights movement. Through the creation of the Housing Executive, housing decisions were taken out of the political arena and placed in the hands of a neutral specialised organisation. By 1983/84, public housing – almost all of which was controlled by the Housing Executive – accounted for 37% of continued here. 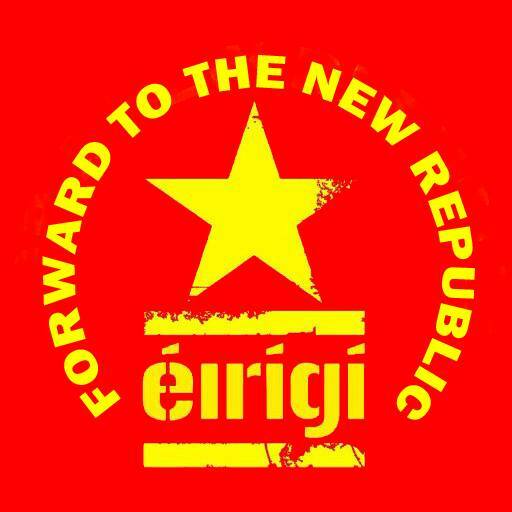 . .
We the Republican Prisoners incarcerated in E3/E4 Portlaoise Gaol send solidarity greetings to our Revolutionary comrades in attendance today, and Revolutionary Socialist activists internationally, engaged in their numerous campaigns. We particularly applaud the unilateral declaration of independence by the Catalan parliament, but as the Catalonian people have now witnessed, colonial powers will never relinquish their illegal occupation voluntarily. History has thought us that it is not sufficient to affirm your independence through symbolic declarations or demonstrations- you must be prepared to defend them. We would also like to commend our imprisoned comrades in Maghaberry Gaol for their continued resolve and discipline in the face of a sectarian aggressor. The oppressive measures being implemented against our comrades needs to be highlighted, but more worrying of late are the increased physical attacks occurring on a weekly base. 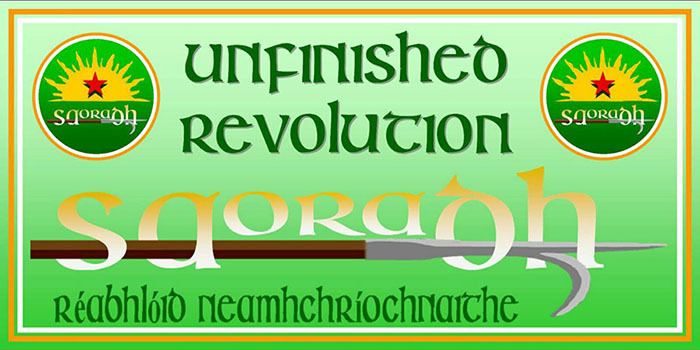 As a small token of solidarity with our comrades, the Republican Prisoners in Portlaoise will embark on a 72 hour fast commencing this week, to highlight the ongoing sectarian attacks that they face. PROTEST! Monday, November 6 at 5:30pm-7pm, City Hall. Bígí Linn. Dublin City Council own 120 hectares of land – enough to build 12,000 homes. There are 20,000 people on Dublin’s housing waiting lists, and many more average income households who will never be able to afford private rent or mortgage. So why are we allowing private developers to make money off our land? Our city councillors CAN solve the housing crisis – by building mixed income public housing for all on public land. Campaign members Cllr. Éilis Ryan and Cllr Cieran Perry are putting a motion before Dublin City Council’s November meeting calling for a halt to ALL use of public land for private, for-profit housing. We are calling on all city councillors to support the motion to end the use of public land for private housing, and to support mixed income public housing on public land. Stop The Vultures – Dundrum Demands Affordable Homes Now! Rents and house prices in the greater Dundrum area are out of control, pushing families into poverty and out of their own communities. Developers, landlords and the banks are generating super-profits off the backs of ordinary families in Dundrum, Windy Arbour, Milltown, Churchtown, Nutgrove, Ballinteer, Sandyford and Goatstown. The government are now attempting to hand over 800 plots of public land to the same vultures that created the current mess! The jewel in the crown of these sites is the 27 acres of lands currently occupied by the Central Mental Hospital in Dundrum. Comments Off on Stop The Vultures – Dundrum Demands Affordable Homes Now!